This tutorial will teach you how the pickup stitches on a heel flap. 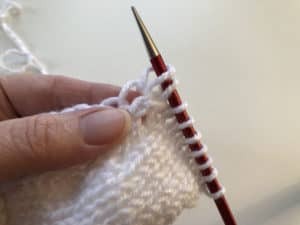 The number of stitches that you pick up and knit will be the same number of RS rows you knit on your heel flap, plus 1 extra stitch (the extra stitch is important for avoiding that hole where the flap meets the rest of the sock). As always, follow the instructions contained in your pattern. We’re assuming you’re starting by picking up stitches on the right-hand side of the heel flap. With the left needle, pickup stitches from your heel flap. Step 1 – Insert the left needle into the front of your first heel flap stitch. Step 2 – Once the needle is inserted, wrap the working yarn around the RN and pull it through. 1 more stitch on your RN and 1 stitch picked up. Step 3 – Continue picking up until all of your heel flap stitches have been worked. Step 4 – Next, pick up one extra stitch where the last of your heel flap stitches meets the top of the foot of the sock. You’ve now picked up stitches along the right-hand side of the heel flap. Step 6 – Knit across the top of the foot of the sock and after completing this you will reach your next set of heel flap stitches to pick up. Step 7 – First, pick up that extra stitch just like you did on the other side. Now, repeat Steps 1-3 on the other side of your heel flap. 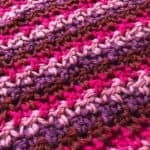 Andi Gallegos- aka Mysistersknitter on Ravelry- learned to first crochet more than 20 years ago from a coworker, while looking for a way to occupy herself during downtime at a call center job. 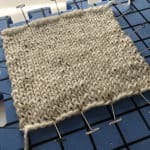 A couple of years later after many attempts to teach herself to knit from books, she found a video that taught kids to knit and it suddenly clicked. 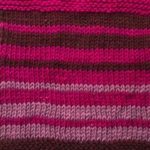 Nowadays it is rare for a day to go by without at least one stitch being knit. 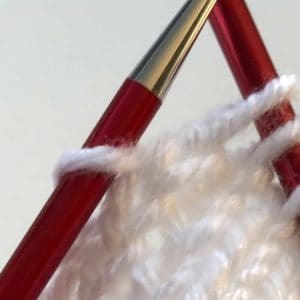 At that time living and knitting in sunny Arizona didn’t warrant a large knitting community, so Andi started a blog called My Sister’s Knitter as a way to connect with other knitters. Andi believes that if everyone knit or crocheted the world would be a kindler, gentler place. Jody loves pouring over stitch dictionaries and trying out new stitches. And while she likes all things crafting (well ok, except that one thing), yarn crafts are her true love (and she has the stash to prove it). She’s a serial starter-of-projects and has a serious problem with finishing things without a deadline. And don’t get her talking about hand-dyed yarns. You’ve been warned.